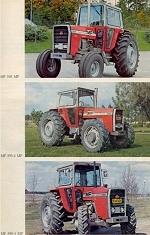 In the middle of the 1970's a demand for better cab's for new tractors than the ones on the MF100-1000 series tractors become more and more important. 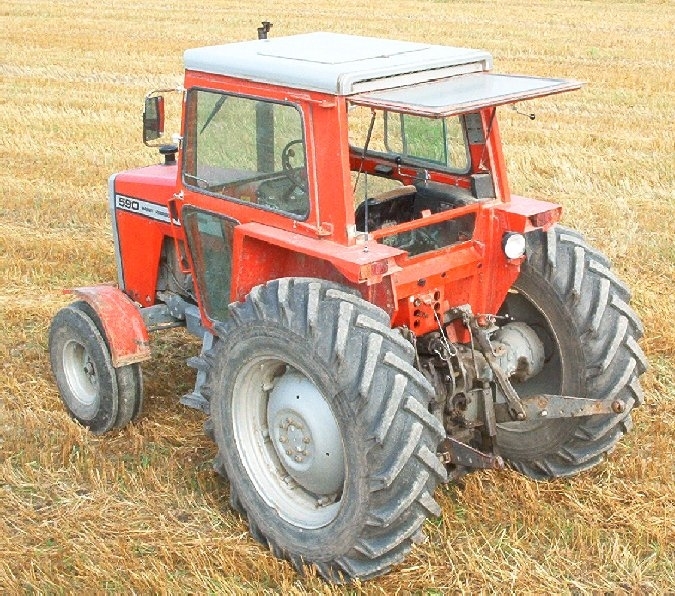 In September 1977 there was a legal requirement for all new tractors to have a cab with noise levels inside not over 90db. 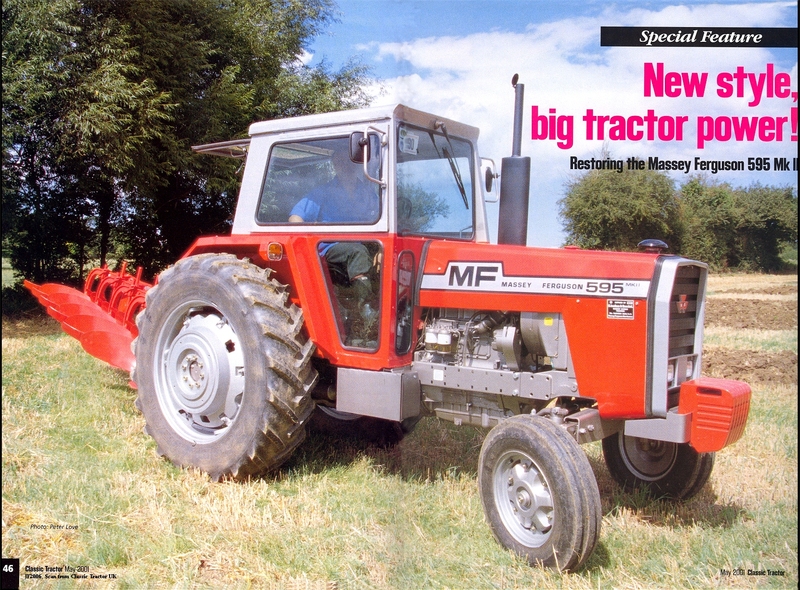 Massey Ferguson created a totally new tractors series to fulfil this requirement. 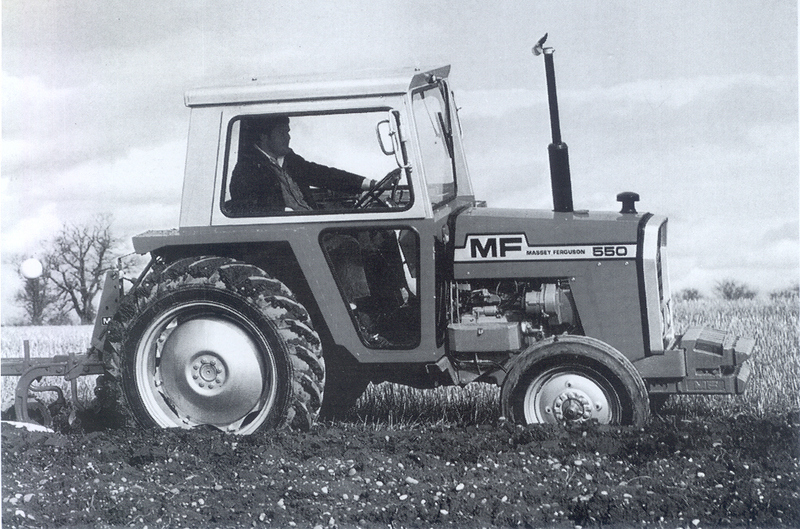 The MF-500 range introduced on the marked in 1976. 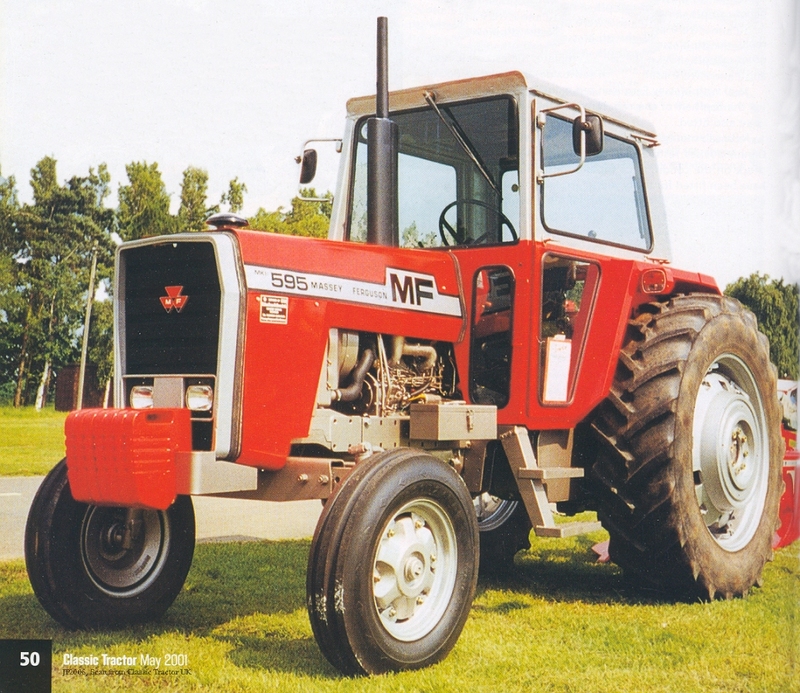 The new MF-500 range utilized remote linkage so all controls were mounted in the cab and not on the tractor body like before. 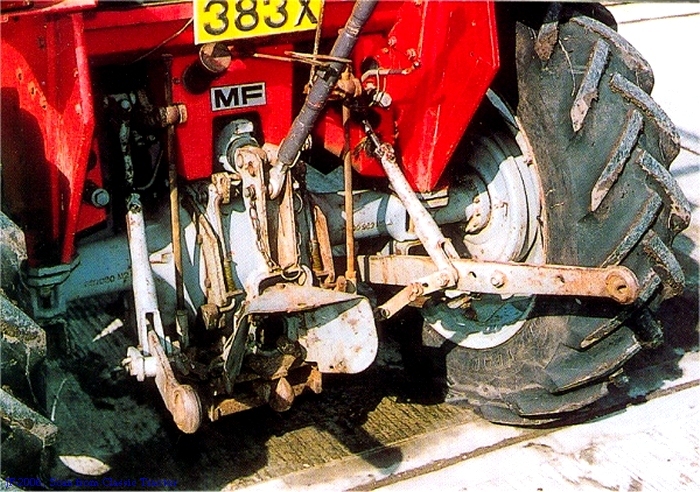 The cab's floor was flat for the first time on a Massey Ferguson tractor. 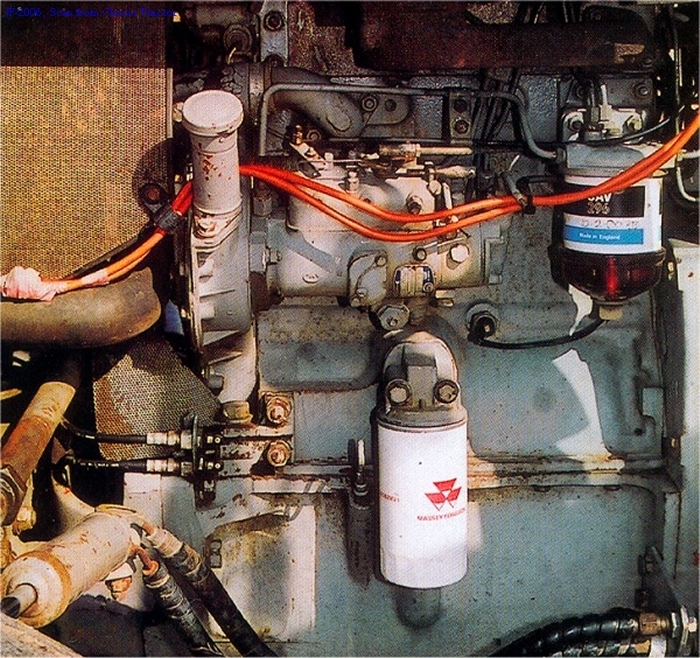 The heating and ventilations system was improved. 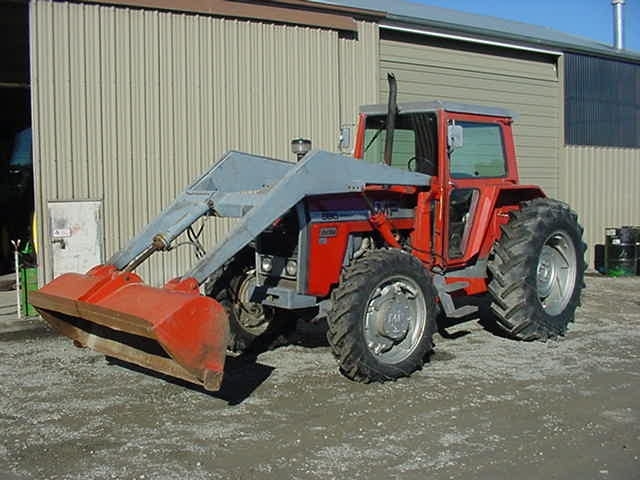 Other improvements was new hydraulics and PTO drive. 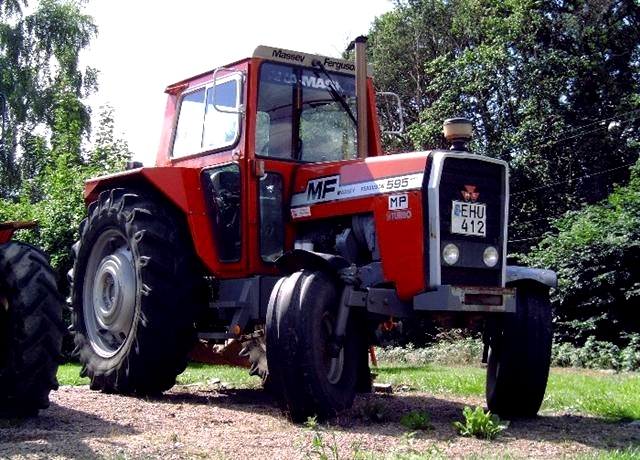 The basic drive line was based on the previous MF100 line. 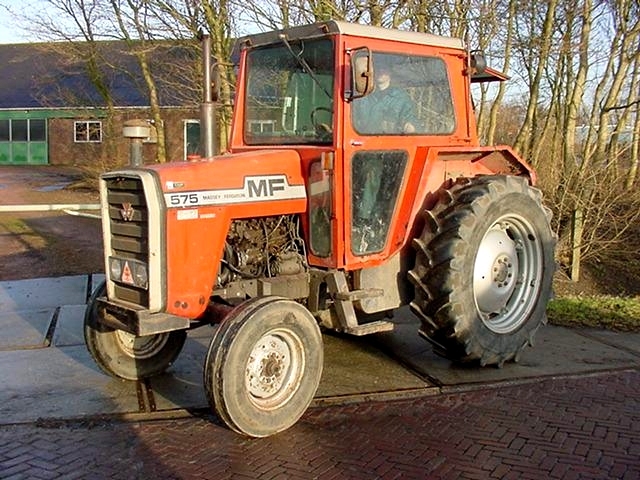 The design of the tractor was similar to the older MF1185 - MF1135 tractors. The new "Supercab" are light years ahead of the earlier 100 series. 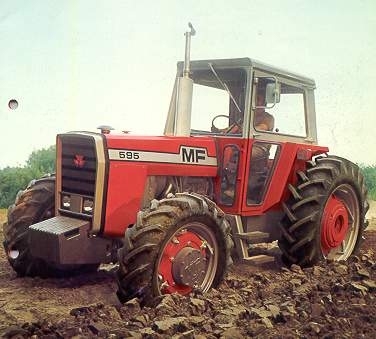 The new rang was: MF550 replacing the MF148, MF565 replacing the MF165, MF575 replacing the MF168, the MF590 replacing the MF185/188 and the MF595 replacing the MF1080* from 1978 the MF575, MF590 and MF595 become available with 4wd. 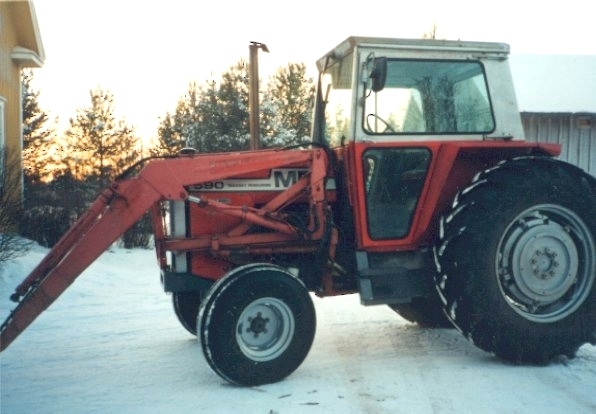 The rang was in production until 1982. 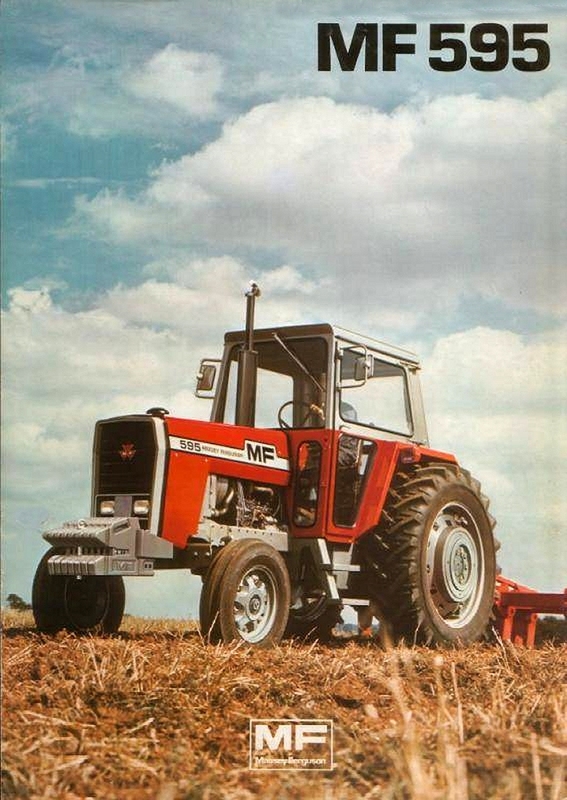 *)The MF1085 was introduced on the American marked in 1973 and sold in Europe as the MF595 mark I. the MF595 introduced with the new MF500 range was a updated version named the MF595 mark II. The smallest of the new range. 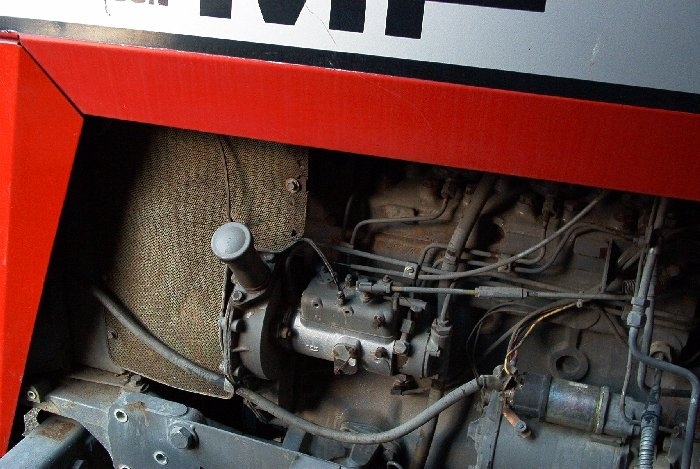 47 hp from a Perkins A3.152S engine. 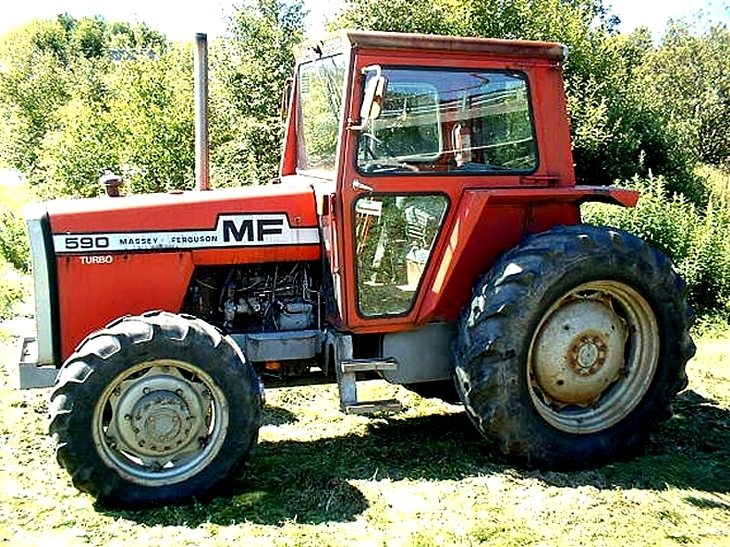 Replacing the MF-148 tractors. Two versions vas available standard and "premium". 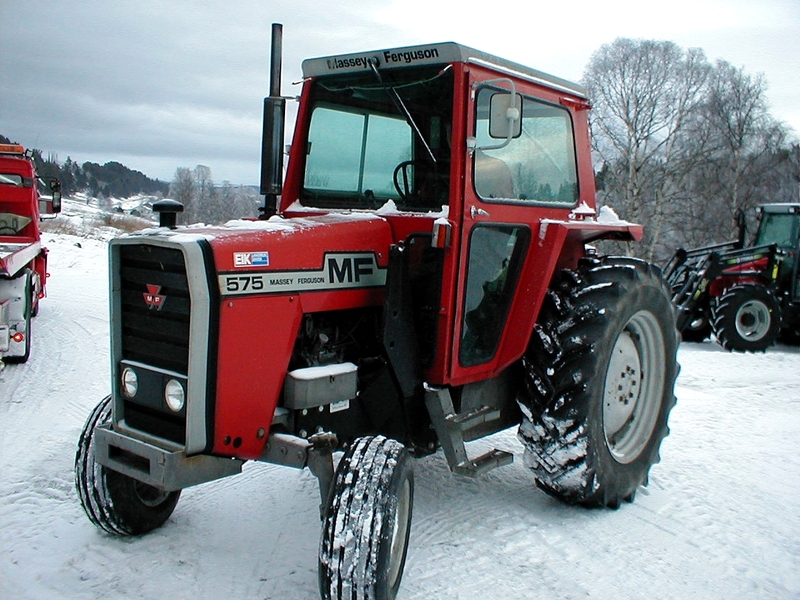 Premium had Multi Power, and better equipped cab with windscreen washer, a heater and better seat. 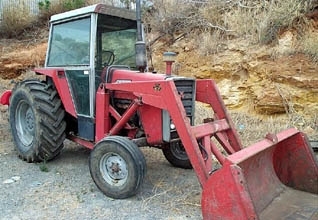 A great small and light tractor,. 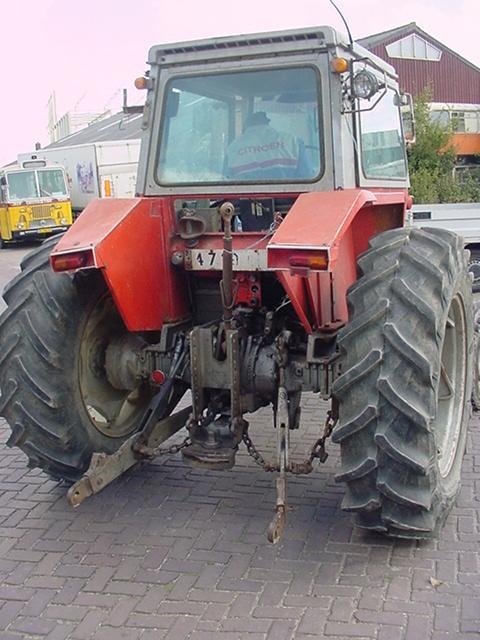 A very good cab, bullet proof engine low running costs, but only adequate brakes and modest lift capacity. May 1976: Launched. 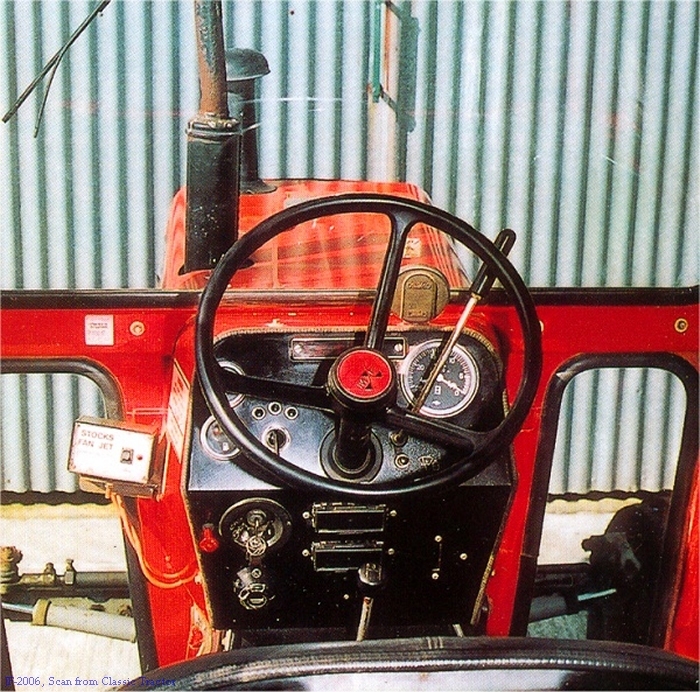 February 1977: Premium spec cab becomes standard. 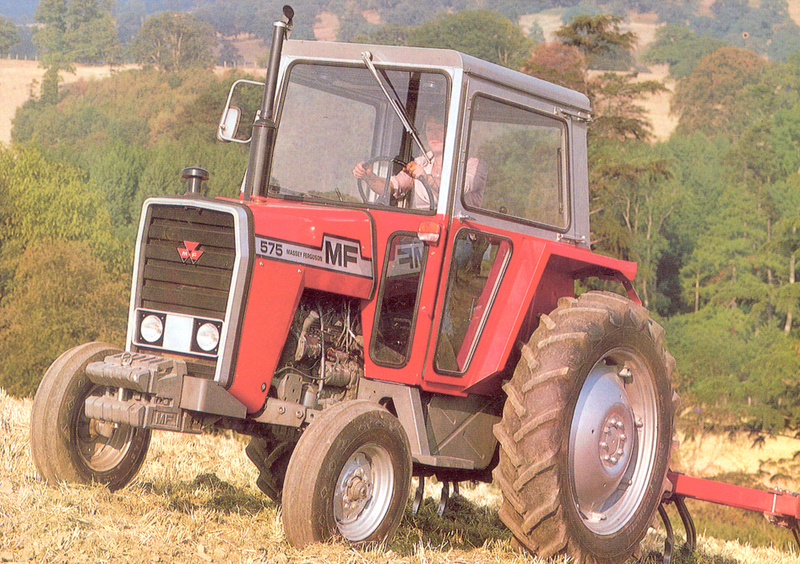 July 1979: Facelift, two-door cabs, new seat, tinted glass and radial rear tyres. 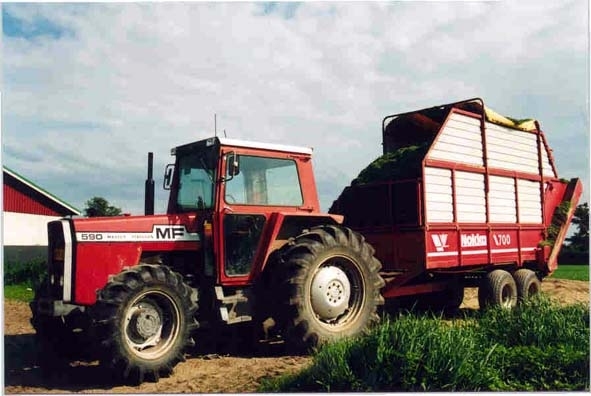 July 1980: Cab red up to the roof. 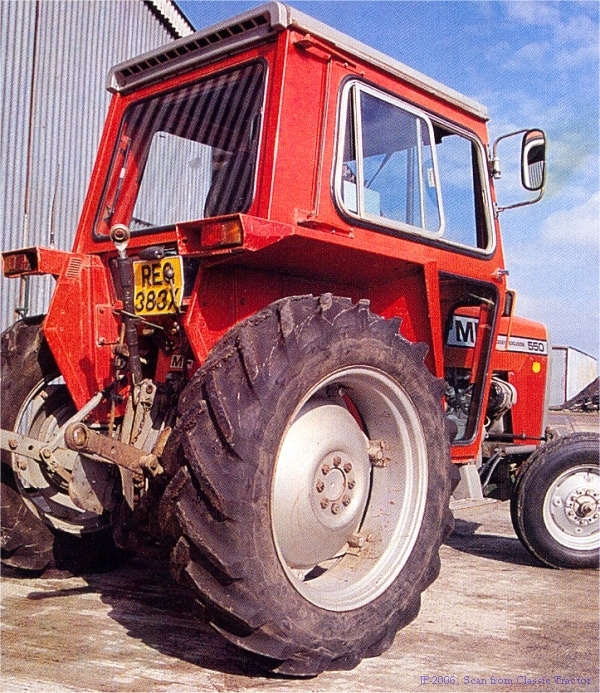 March 1981: New front grille, new lights. 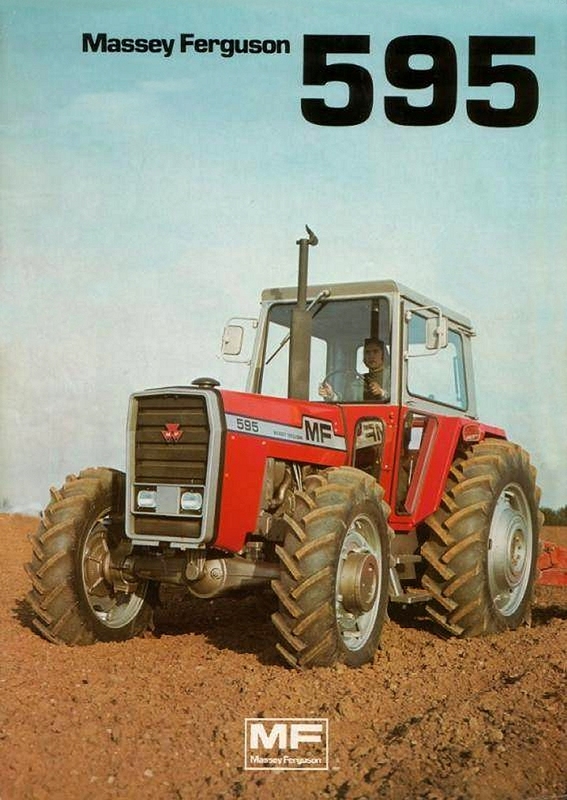 February 1982: end of production. 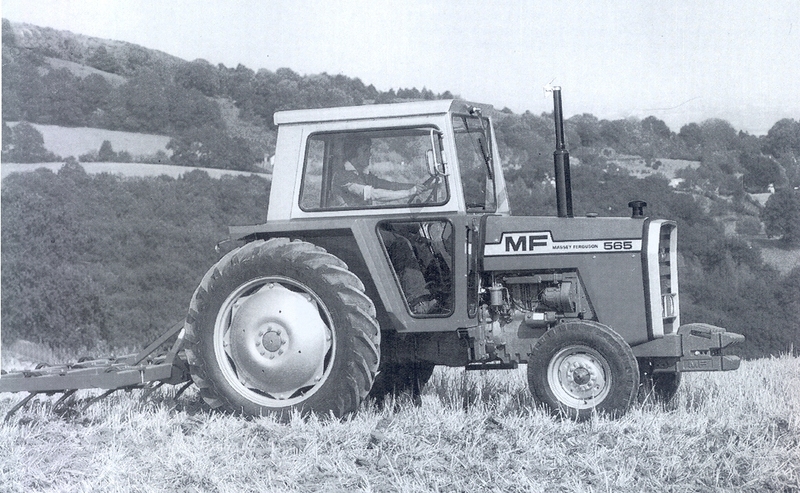 MF550 past July 1979 This is a post 1980 model. 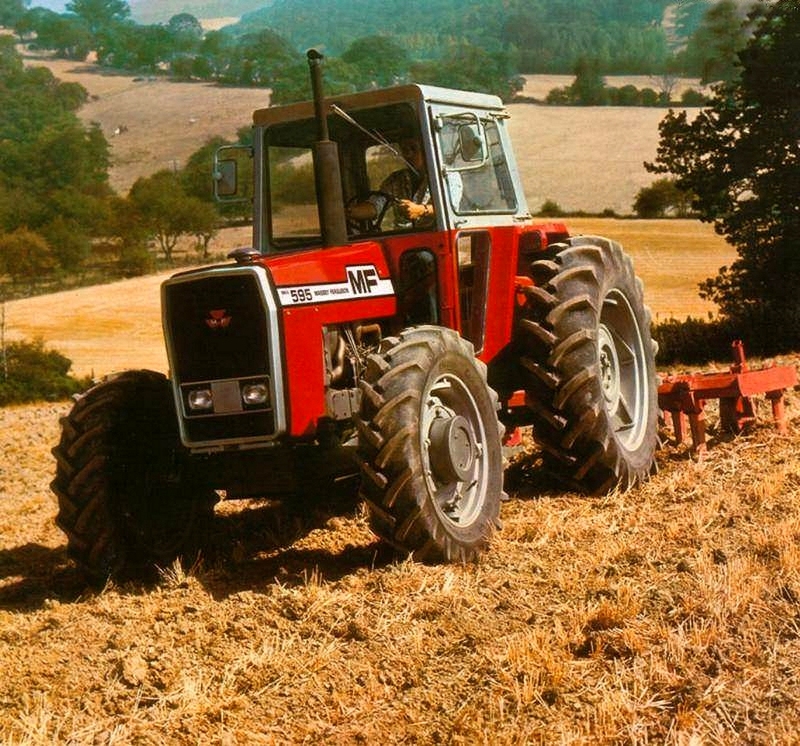 The last 8 pictures are scanned from Classic Tractor UK. 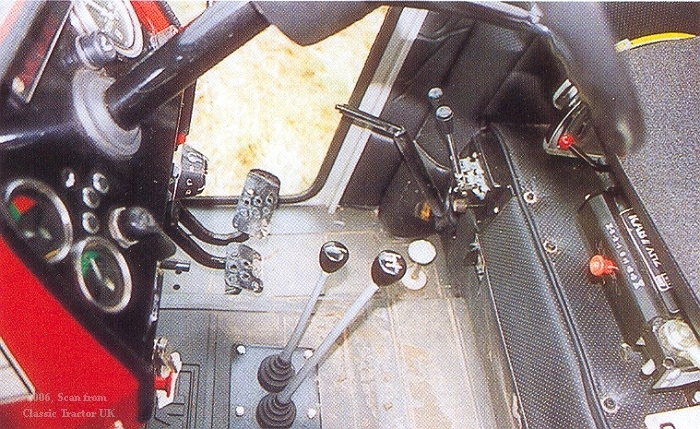 Instrumentation, note the tachometer with anti-clockwise register. 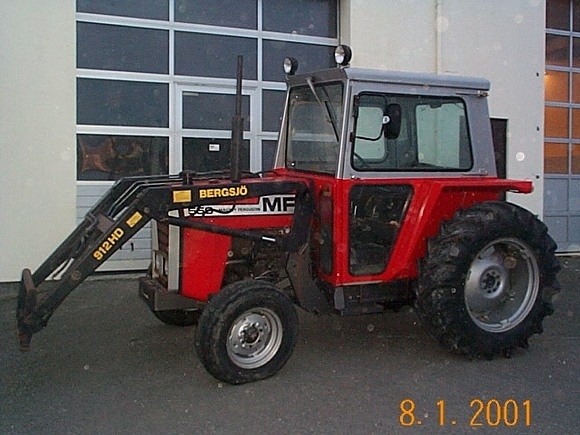 Lift capacity 1415kg Top speed: 30km/h with 11 x 32 rears. Disadvantages with the new design. 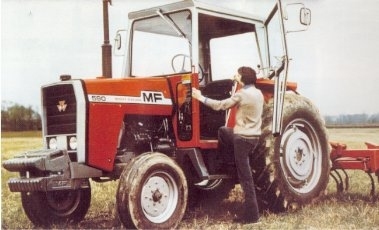 On all models in the MF500 range till mid 1979, there was only one door to the cab, on the left side. This was not always popular. 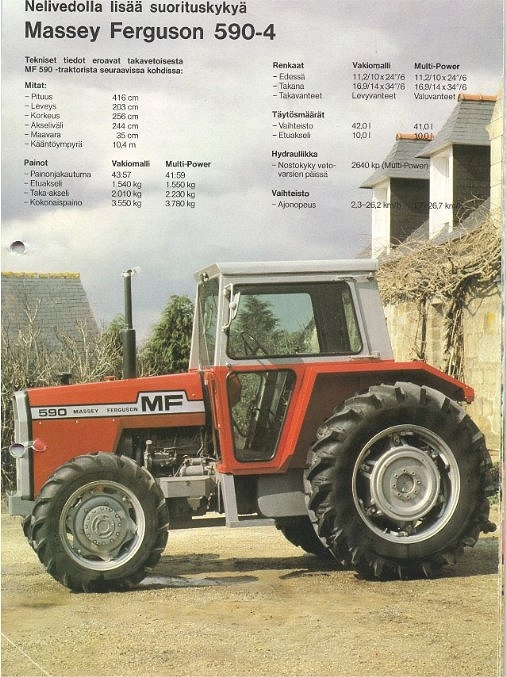 And in the middle of 1979 the second door was introduced. In the middle of 1980 all cabs were painted red up to the roof. 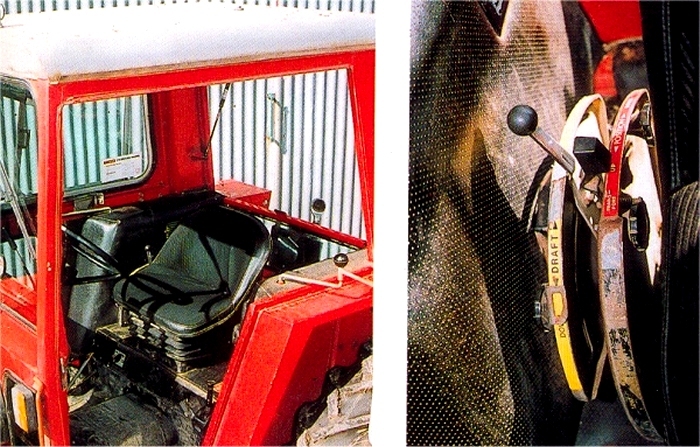 And then in 1981 a new grille with integral headlamps was introduced. (not on all models) Another problem was the complex cab/control layout. 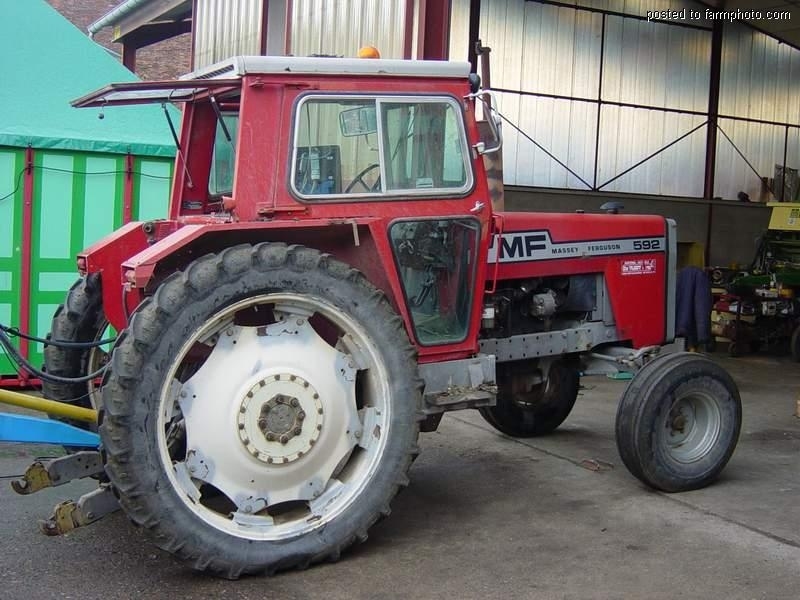 It was very expensive to service the tractor. 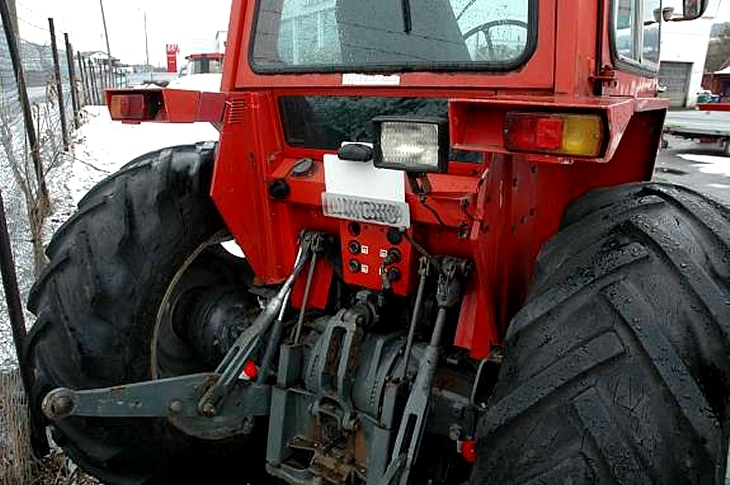 Much of the cab had to be removed for more complex service than before. 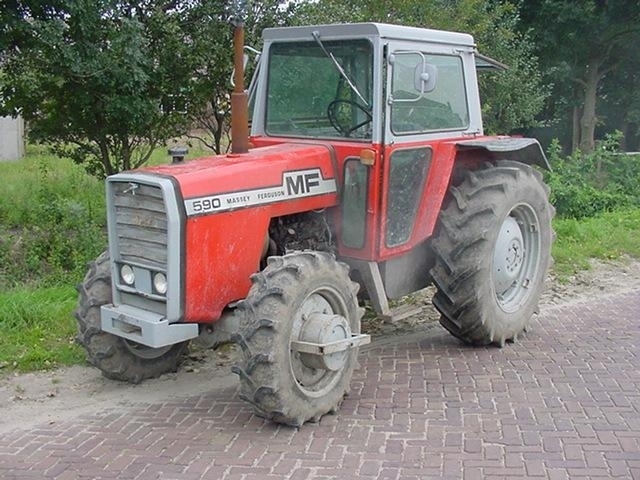 The "missing" model pictured at least... Eric Nieuwenhuis from Nederland sent me this picture of the MF560. 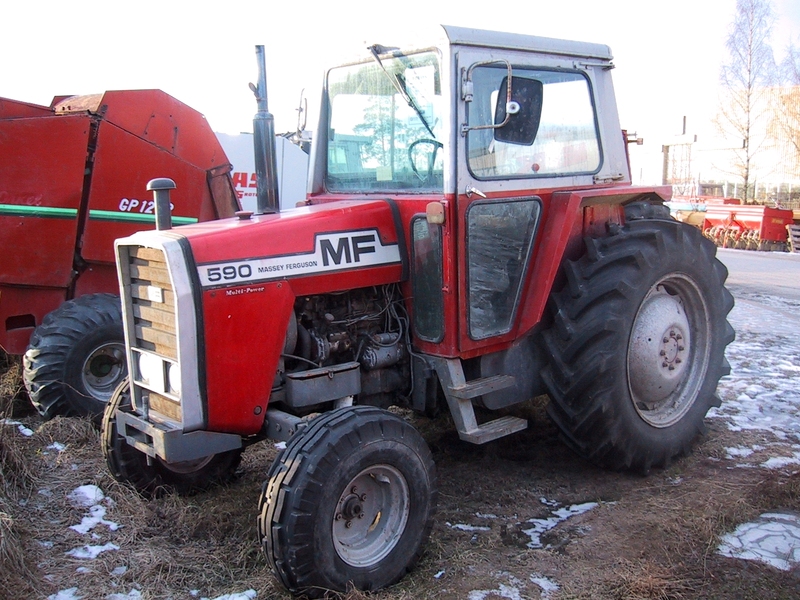 Must be an rather uncommon model, haven't found information about the MF560 on internet at all. Thanks to Eric for the info and the picture. 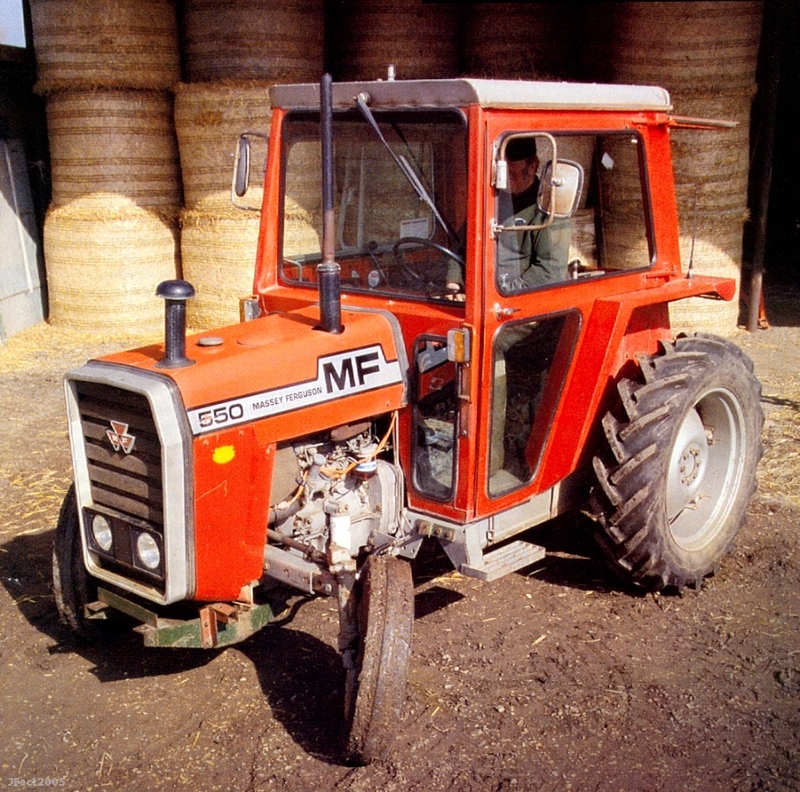 The MF560, produced from 1976-82. 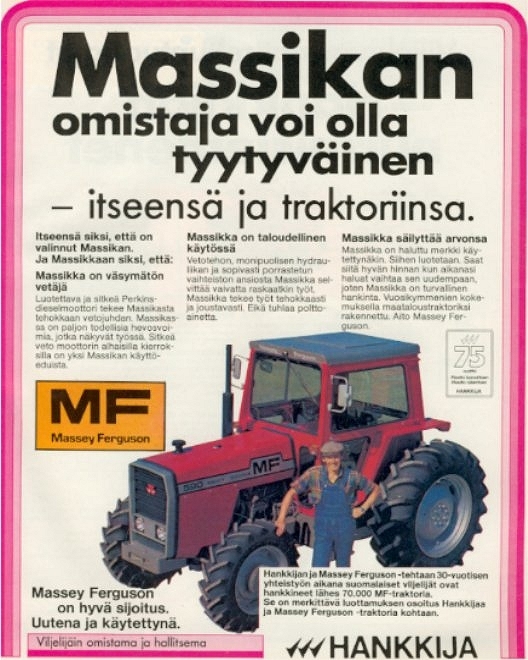 It had a Perkins AD.4.203 engine producing 56 hp. 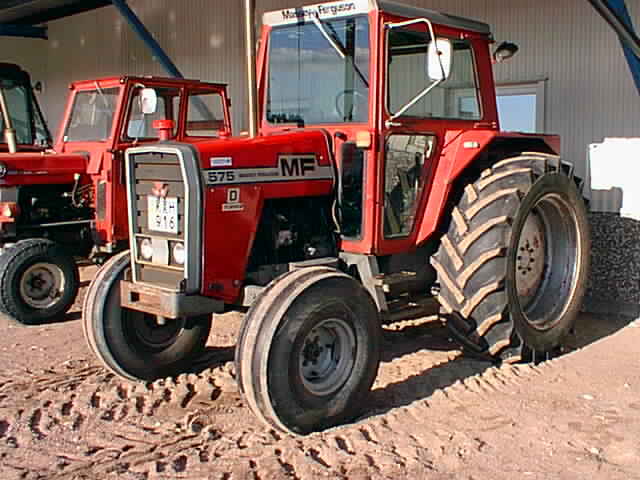 The second model in the range. 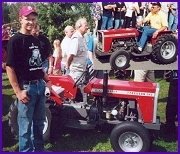 It has a Perkins AD4.236 engine developing 60hp. 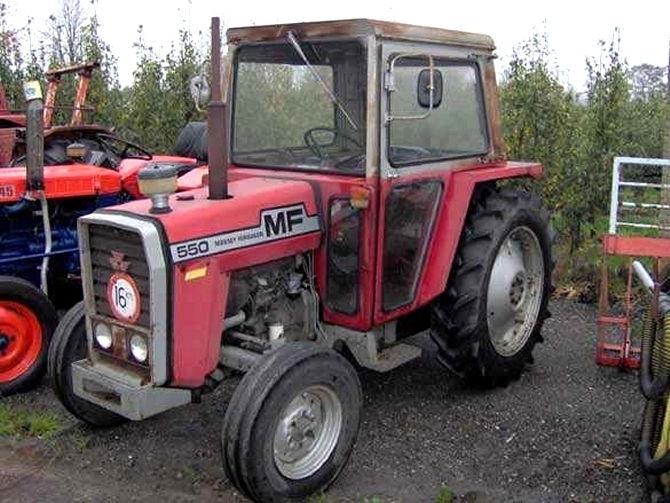 Replacing the MF-165 tractor Compared to the MF165 it had a new engine. 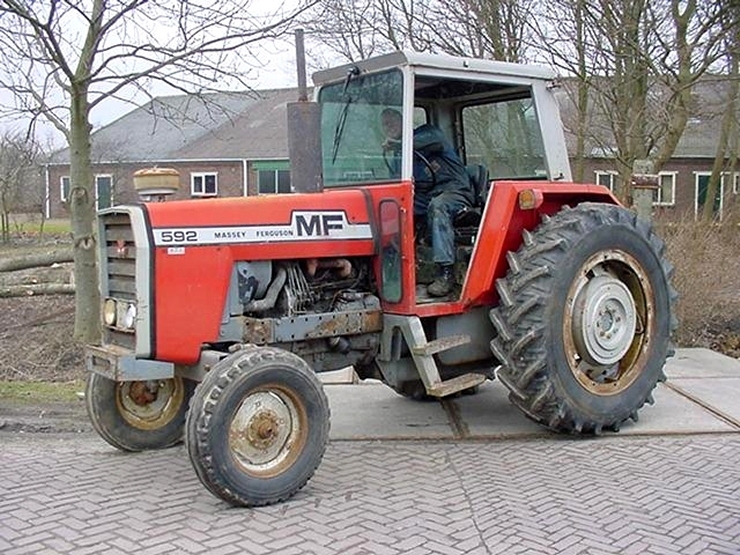 Actually the MF565 have a derated MF575 engine instead of the MF165's AD4.212 engine. 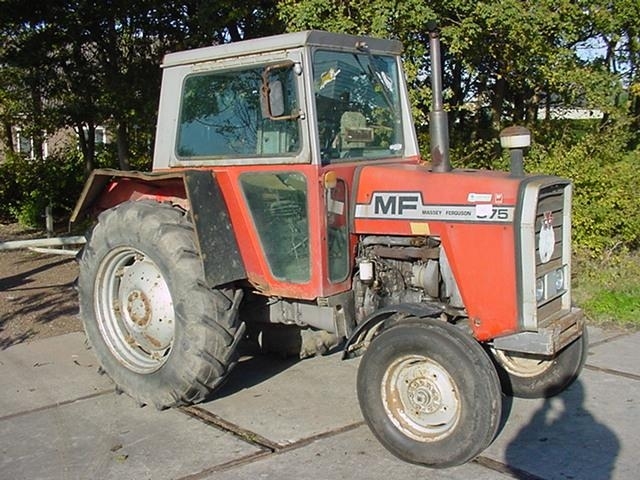 More information and pictures of the MF565 needed. 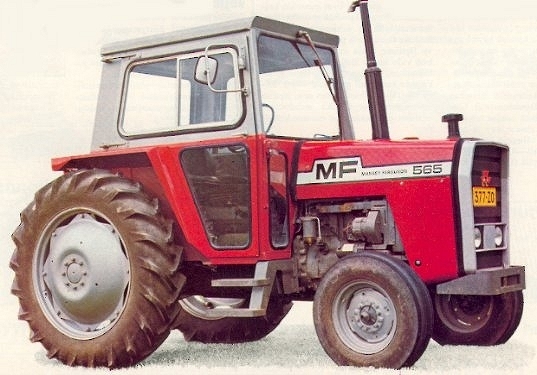 A MF-565. 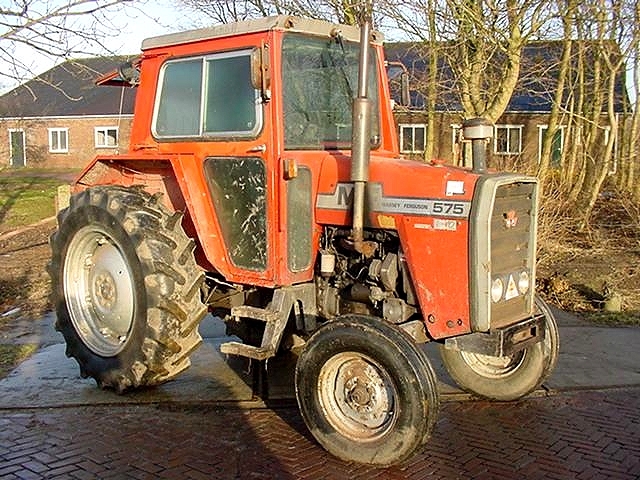 An early 1980 model with the right door, but without the red colour on the cab. 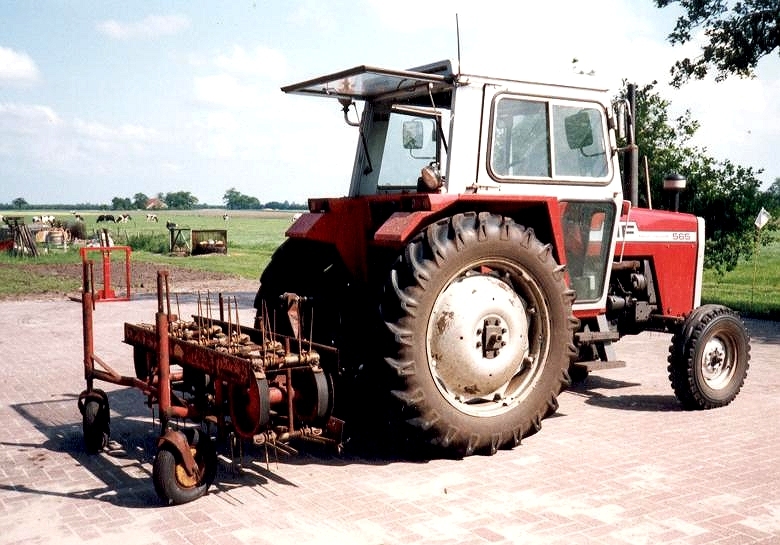 An early model without the right door. 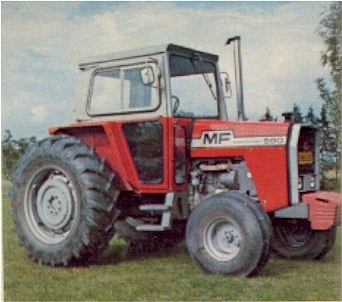 1979 model. 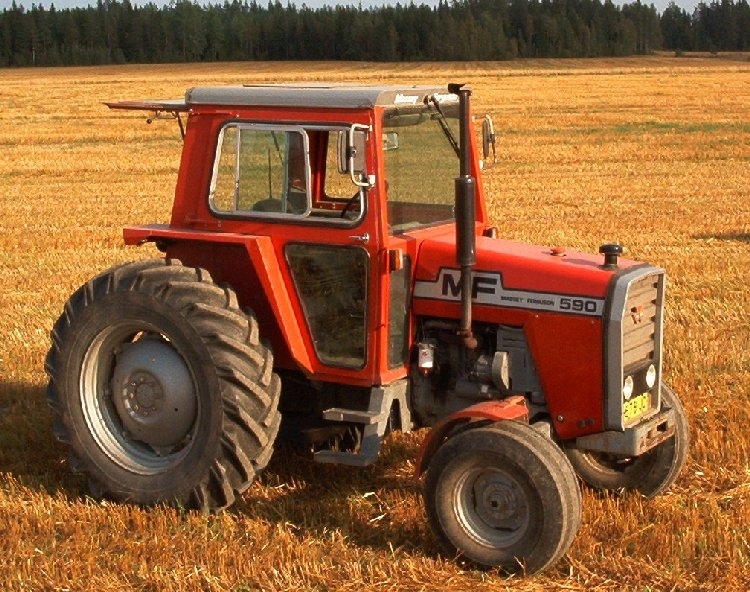 1979 model. 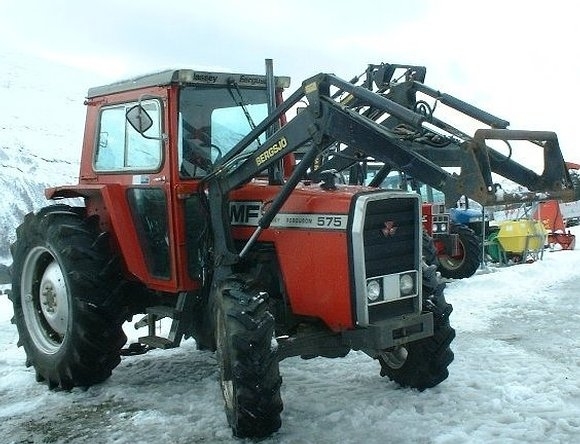 Late MF565 Norway, read more? 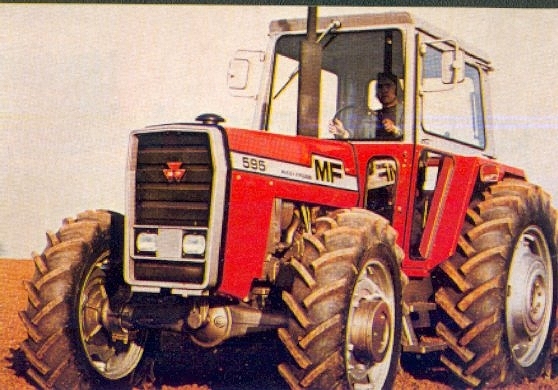 Note: on some marked there was a MF- 565F, actually this is a MF-575 with another decal. Thanks to Daniel Lasén from Finland for the missing information! 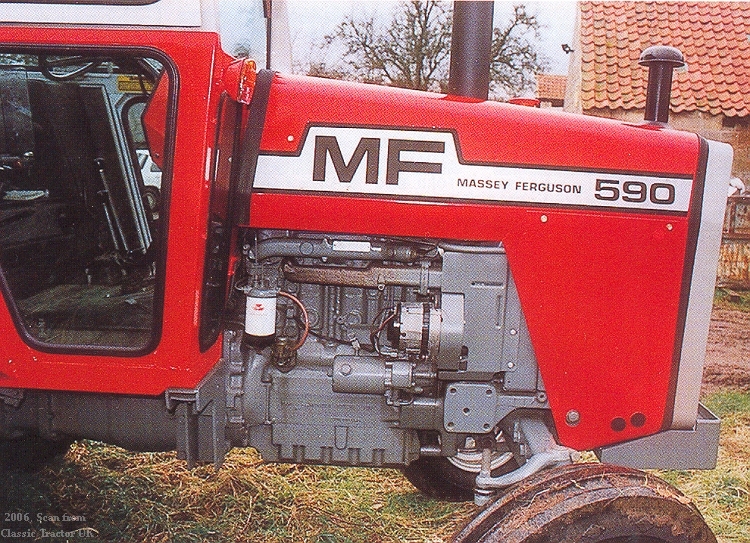 Then next in the range, the Massey Ferguson 575. 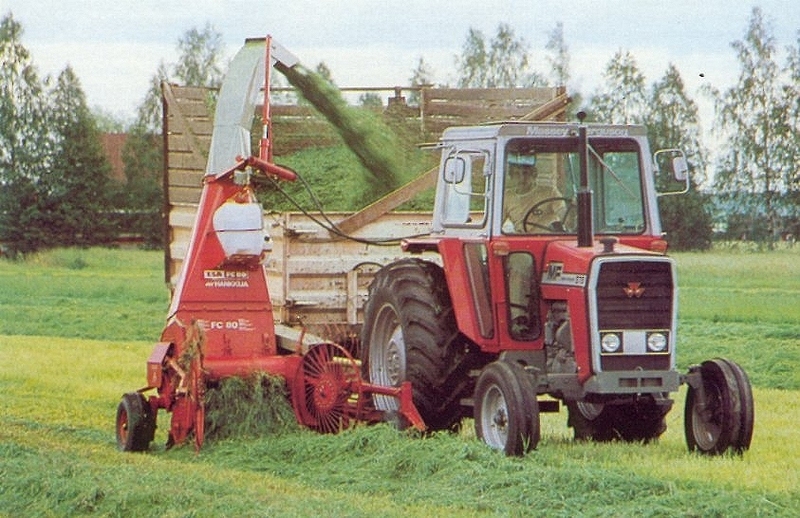 The MF-575 had a Perkins AD4. 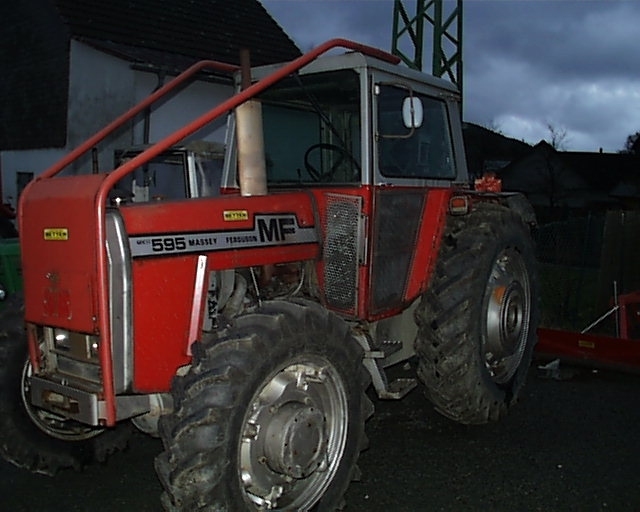 236 engine, similar to the one in the MF-565. 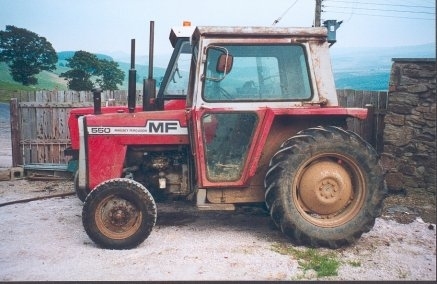 But with a slightly bigger power output of 66 hp. 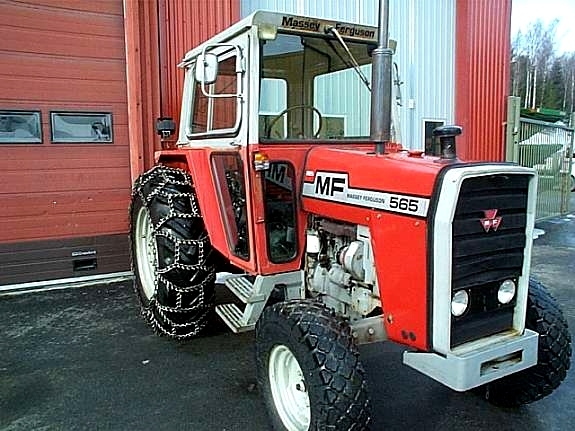 It replaced the MF-168 tractor. 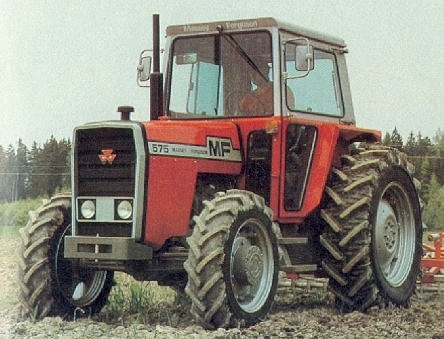 The MF575 was the "smallest" of the 500 range you could get with 4x4. 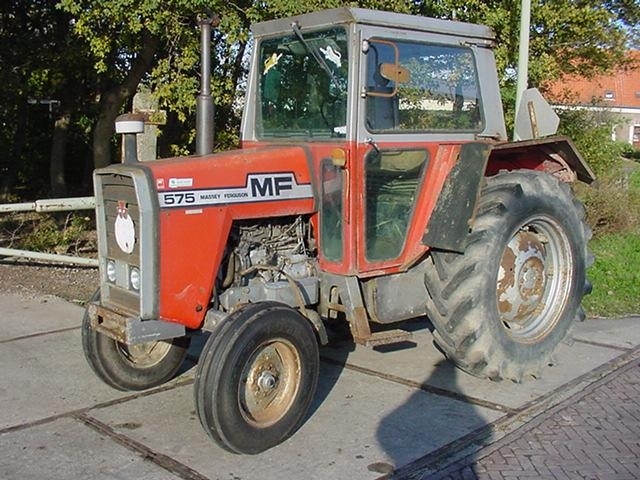 More information and pictures of the MF575 needed. 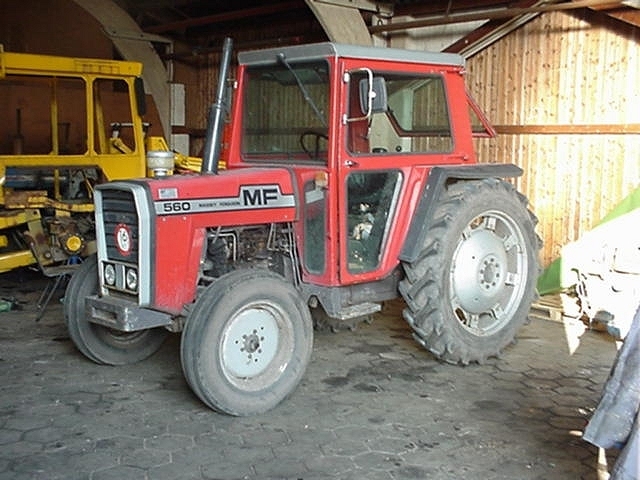 A 1979 model, an early one before the right door, see next pic. Note the missing door. 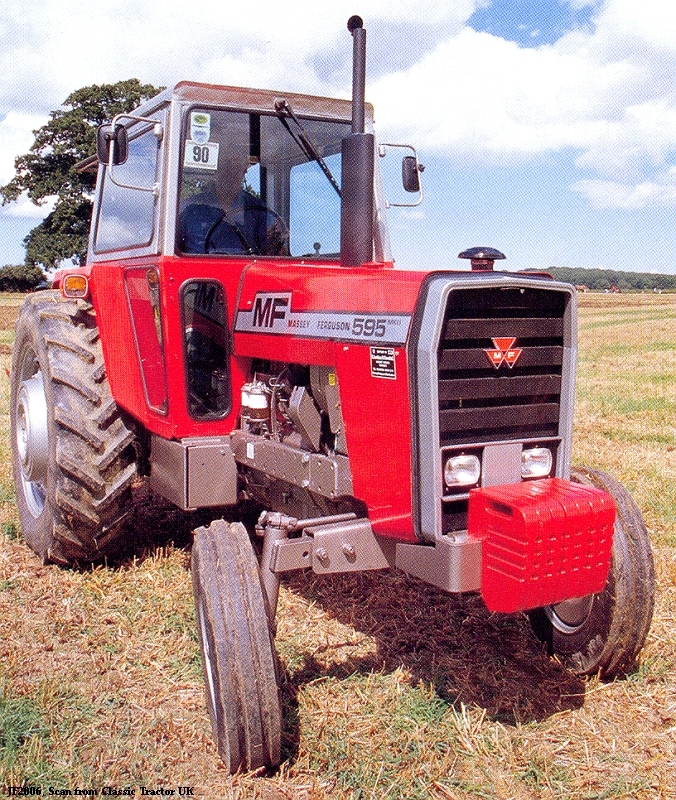 One of the last MF575, a 1982 model, note the right door and that the cab is painted red all over. 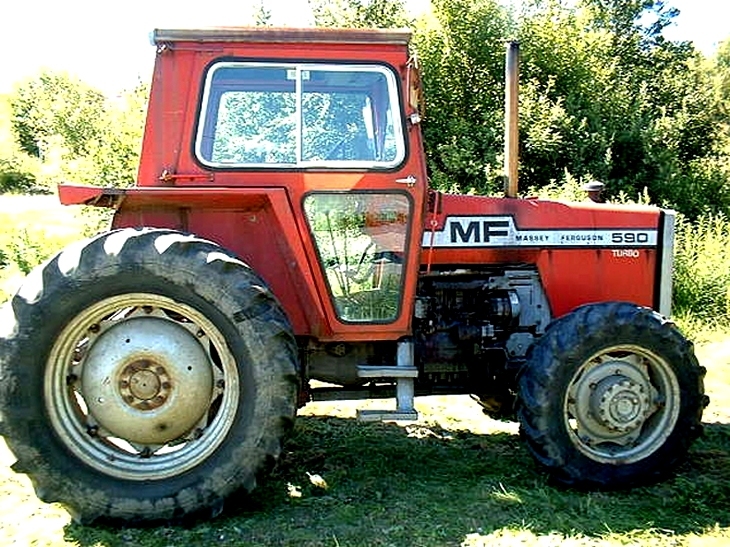 A early MF-575-4wd tractor. 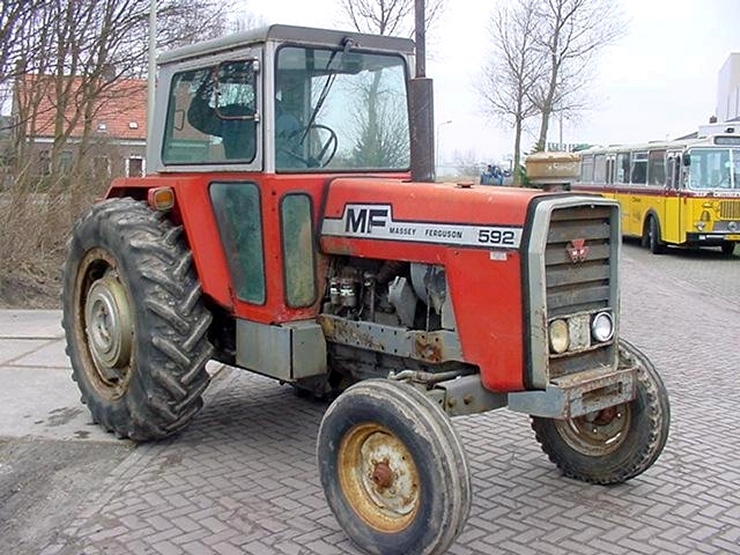 And a late MF-575 tractor. 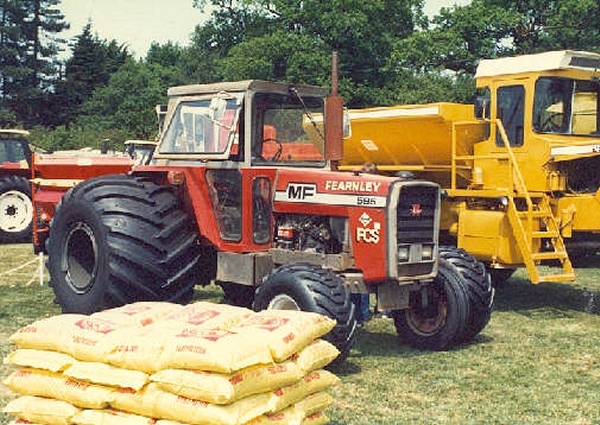 The one on the picture at right, I am not sure what model, the picture said MF575, it looks smaller. 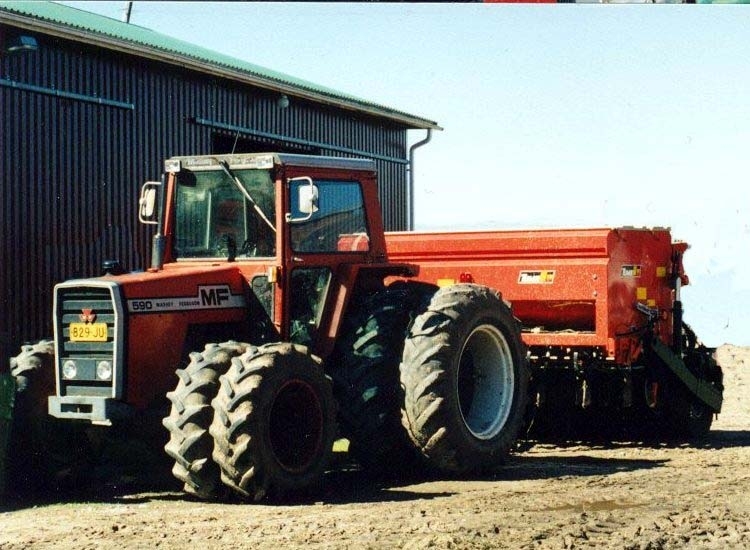 and the cab looks like the on on the bigger MF26XX models. 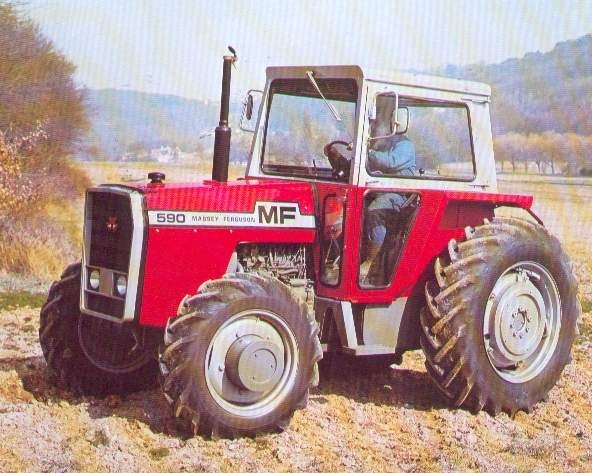 The MF-590 Turbo, a nice machine. 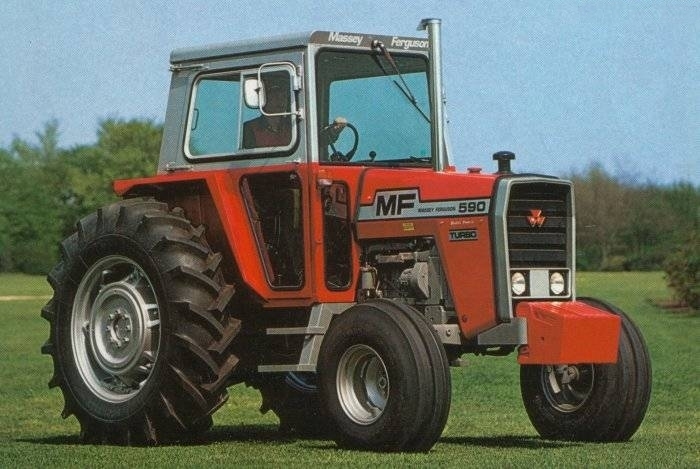 There was a special version of the MF-590 equipped with a turbo charger. 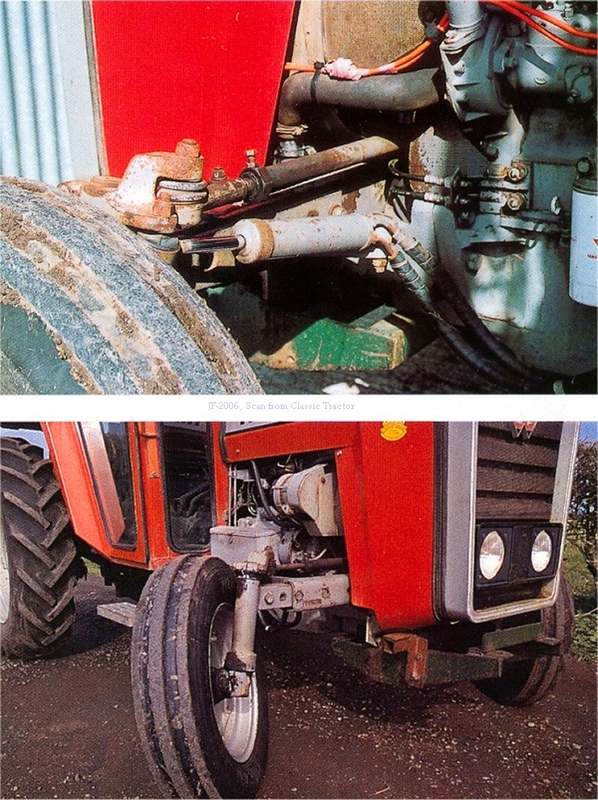 the engine was the same as in the ordinary 590. 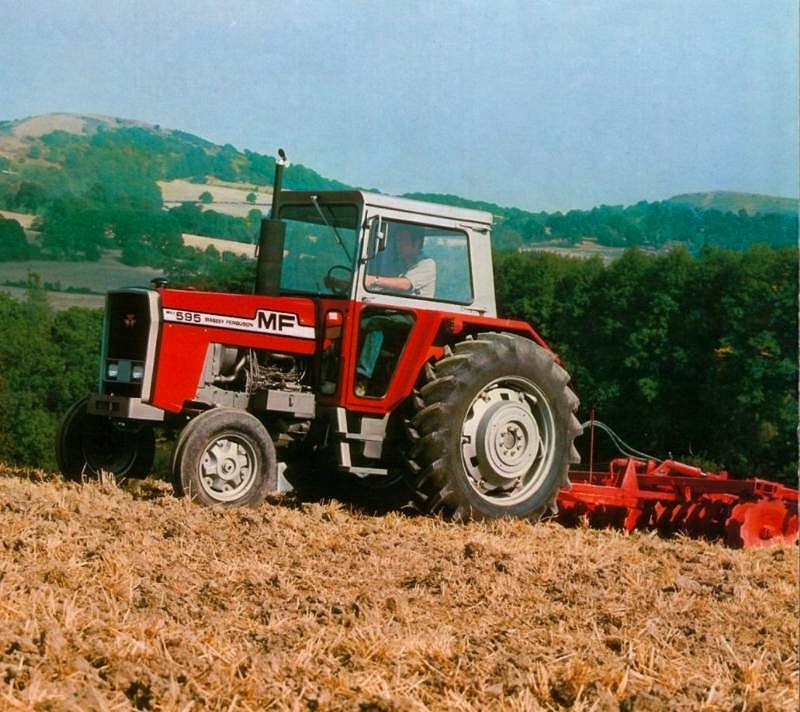 But the power output was 90Hp. It's easy reckoned bye the exhaust system. there was also a little sign telling what was extra-TURBO. Early model Early model Early model, a nice one. 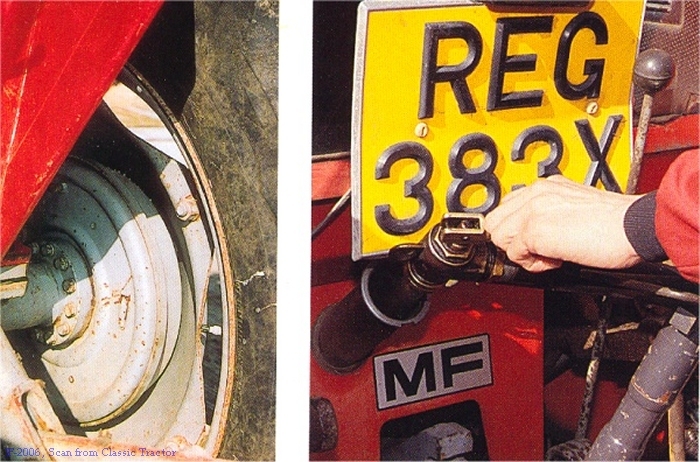 Not the original sign, probably aftermarked turbo. 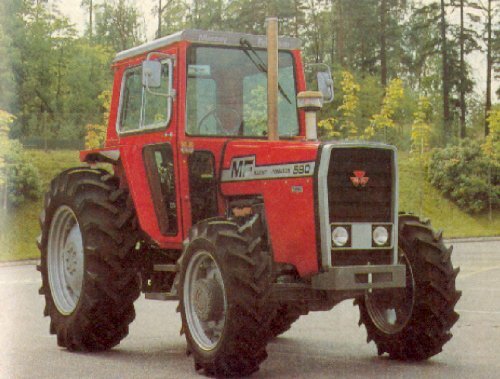 A late 590 turbo with the updated cab and a slightly different grille. Late model, 1982 Late model, 1982 Late model, 1982 Late model Not a good picture, but the exhaust system clearly shows on this pic. 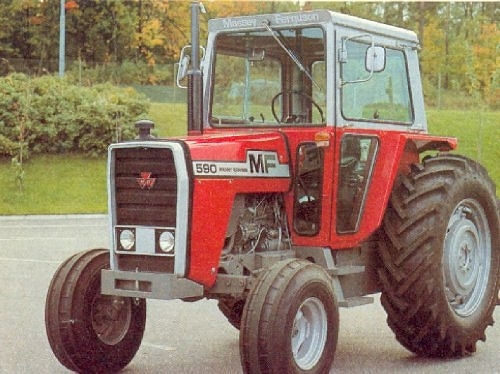 Have found little information about the MF595, there was at least two versions the MK-I and later the MK-II. 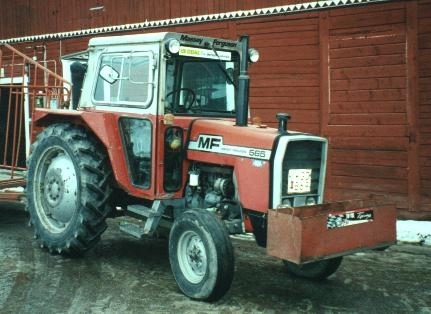 Jesper from Denmark emailed me about the Turbo version: " I don't think that the MF 595 ever was delivered with turbo, but a company in Denmark has developed a exhaust manifold with SCAN turbo charger on. 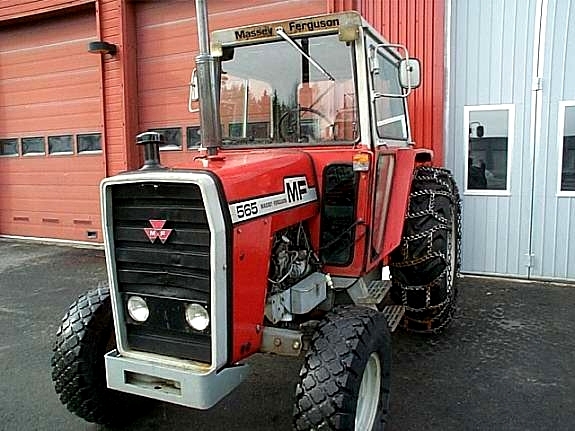 The companies name is Daubjerg and lays in Copenhagen." Thanks for the information Jesper. 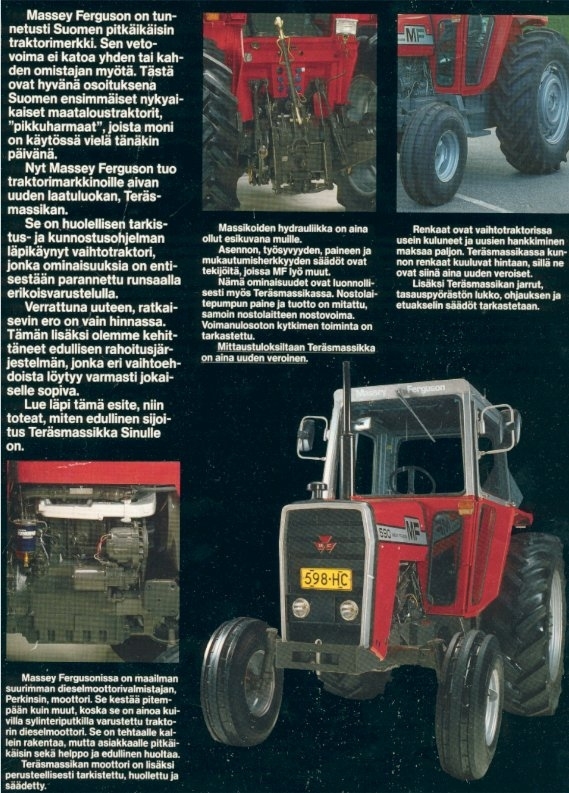 More information from Finland: The 595 were delivert with a Turbo charger from general agent Hankkija in Finland. 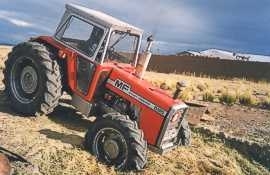 It had 110 hp and was sold as MK-II version. 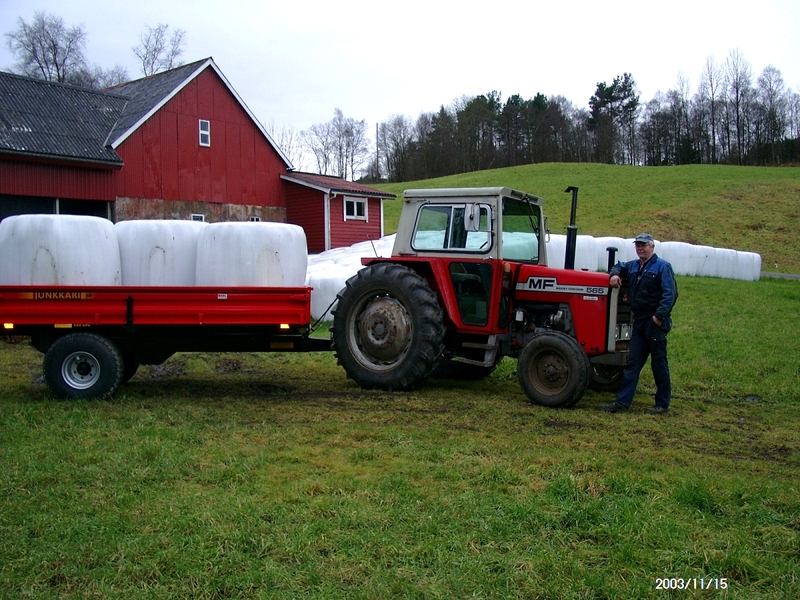 Thanks to Johan Storgårds for the information. 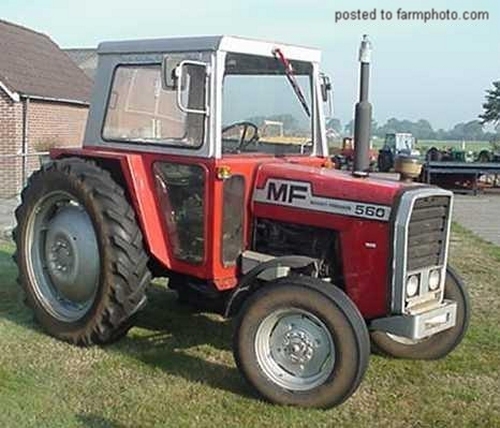 If anyone can provide more information about the MF 595, I would be very happy. * )Thanks to Pudding for the correction. 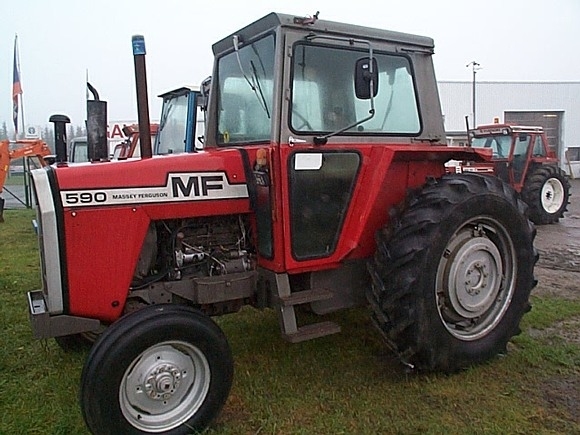 Another "missing" model, the MF592. 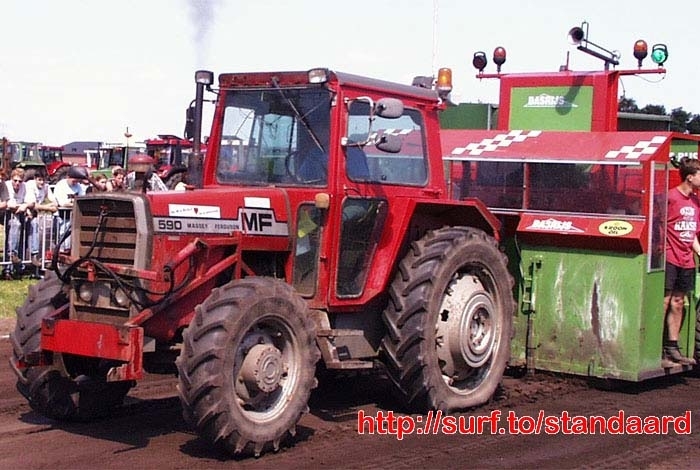 One picture found at Farmphoto.com the two others sales advertisings in Nederland. 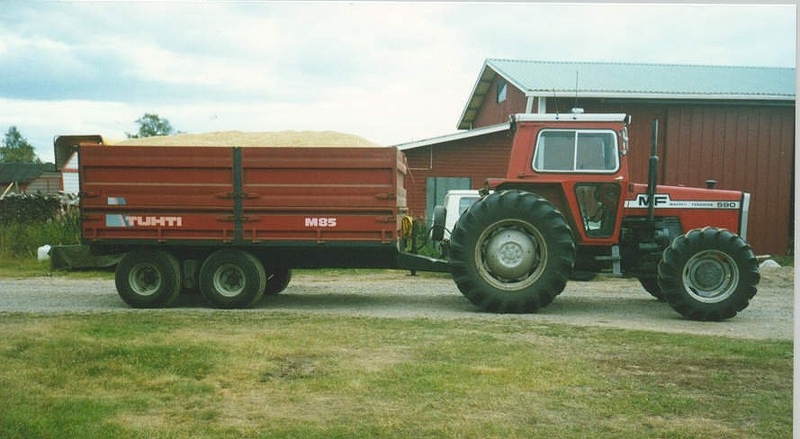 Picture at left, seller says 1980, but it seems older, just one door in the cab. 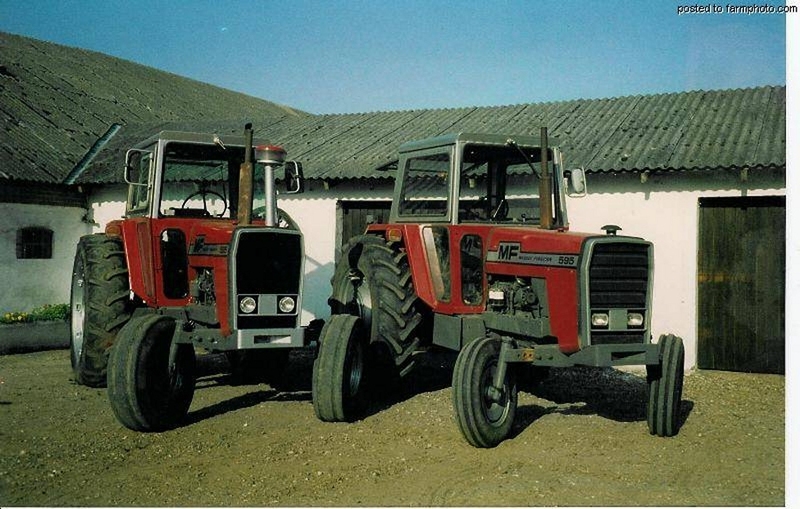 the one at right looks like an early 1980 model with the red cab. 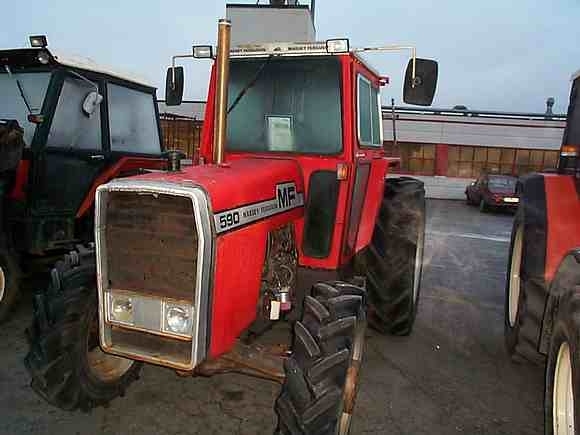 Have no info about the MF592, looking at the pictures it looks much like a 595. Don't know a thing about this one, anyone? My email address can be found at page bottom. 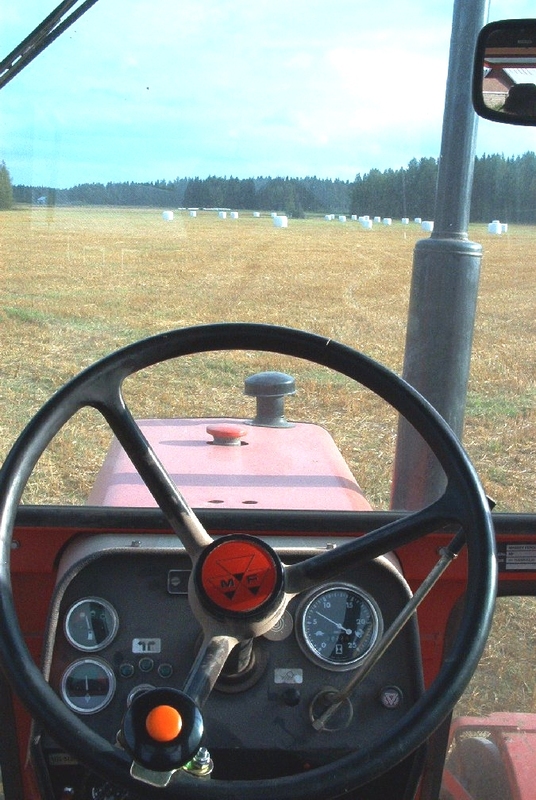 The MF-590 at work and some details. 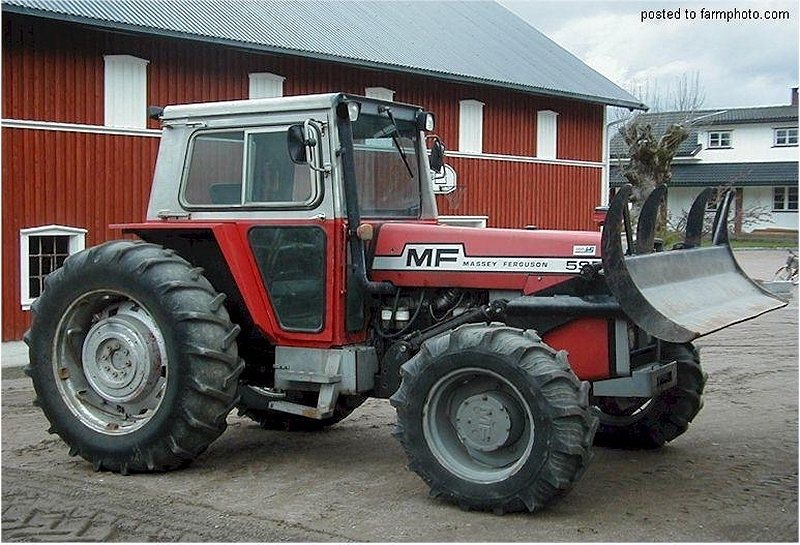 The MF590 pulling heavy loads in this three pictures and the three below, belongs to Markku Raappana from Finland. Thanks for the pictures. Some advertising's for the MF500 range. From Finland. 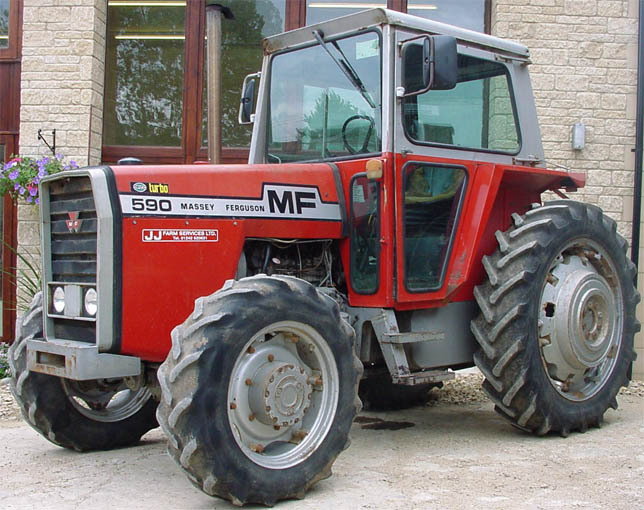 A really special version of the MF-500 range. 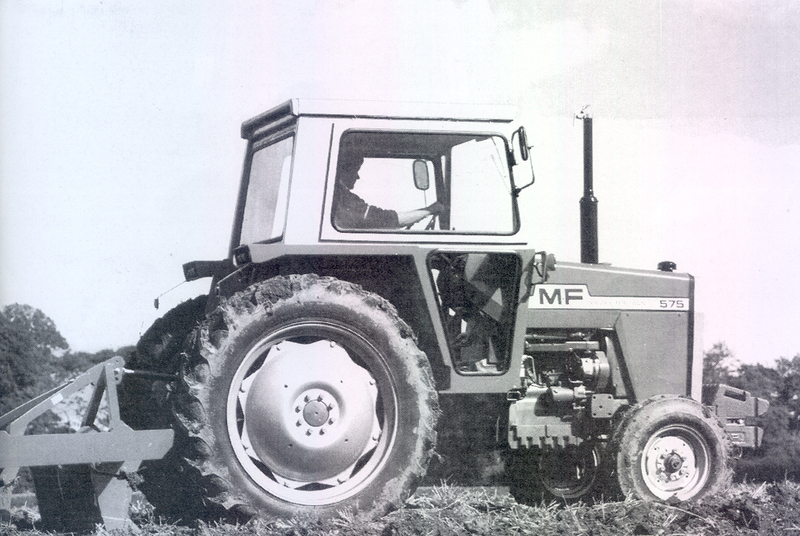 the MF-543. Every young farmer's dream. 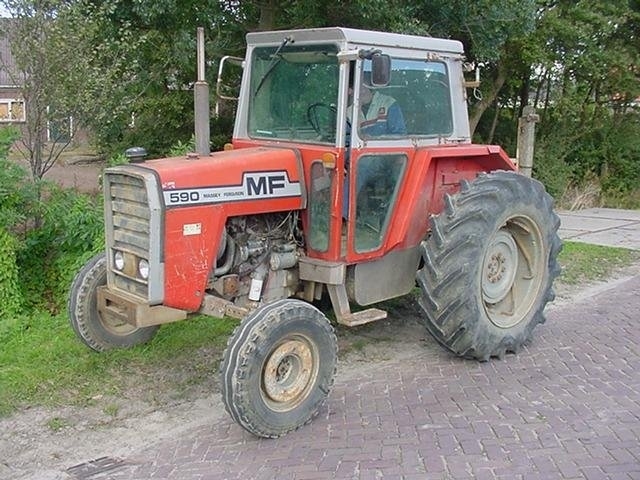 If you have some information about this "MF", please send me an e-mail.